Fall is here and the holiday season is upon us. Halloween is this week and soon the neighborhoods will be teaming with trick or treaters. Check out the following tips and tricks to be sure your yard is safe and children are protected. 1. Clean up and toys, trash, or animal droppings. Think how awful it would be if Princess Aurora stepped in do poo. Rake leaves and pick up sticks. Put away ladders, buckets and garden tools too. 2. Roll up garden hoses onto racks, remove or secure them. If your sprinkler heads are a hazard or could be damaged by traffic, consider placing a upturned planter over them with an LED light on top. 3. Use glow sticks, LED lights, and other safe lights to illuminate your yard. Work to be creative and not kill the mood, but make sure sidewalks, stairways and trip hazards are well-lit. 4. Keep pets inside the house, the back yard, or in a safe location away from the front door. A barking dog can scare a young child and ruin the night. Cats are apt to make a dash for outside if frightened by noise and commotion. 5. If you have outdoor decorations, make sure they are well lit and out of the pathway. Cords can be particularly hazardous. Make sure they are taped down securely if they are close to a pathway. 6. Turn off all lights when you have run out of candy or patience. The porch light is the most obvious, but remember to turn off other outdoor lights as well. 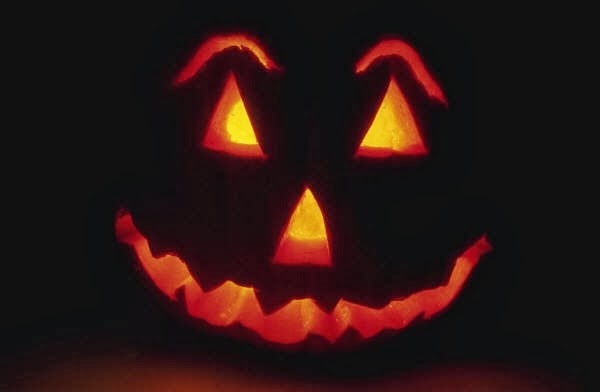 If you want your home to maintain a Halloween atmosphere, consider leaving a small battery operated Jack O'Lanter by the doorway or window. 7. If you need to back out of your driveway, be sure to be extremely cautious. Drive very slowly and use your signals to notify trick or treaters to your intentions. As always, we appreciate your referrals very much. Please let us know if you know of family or friends who might be thinking of moving. There are seemingly endless options through which homeowners must navigate when buying a new garage door: the style, materials and accessories, just to name a few. But perhaps the most important feature that should top the garage door consumer's list is energy efficiency. Why? Because the garage door is generally the largest moving object in your home and offers the greatest exposure to the elements. An insulated garage door will maintain the temperature in your garage in the winter and in the summer and likely decrease your heating and cooling costs. Insulated garage doors not only make the garage itself more comfortable to be in, but also the rooms adjacent to or above the garage. A well-insulated garage also helps keep moisture out, and its sturdy construction offers a greater noise-reducing sound barrier. What should consumers look for in an energy efficient garage door? For starters, check out the R-value. R-value is a measure of thermal resistance to heat flow and is how most manufacturers show the energy efficiency of their product. The higher the R-value of a door, the more insulation you'll get. Second, look at the door's construction. Well-insulated doors will have a "triple-layer" construction, consisting of environmentally safe polystyrene or polyurethane thermal insulation between two layers of heavy-duty steel. Some insulated garage doors also include a thermal break which is a nonconductive material within the door that keeps thermal energy from passing through, resulting in improved energy efficiency for the home. Well-insulated garage doors should be able to stand up to the most extreme of conditions while simultaneously protecting your garage and the rest of your home. Whether your garage door withstands heat, wind, snow, rain, or all of the above, it's the largest line of defense for your home. Make sure that it's working hard for you by reducing your home's energy consumption and providing strong, durable protection from the outside. Your utility bills - and the rest of your (climate-controlled) house will thank you. It may be the most obvious update but painting is an easy solution to change the look of a room in an instant. Whether you paint an entire room, create a bold accent wall or incorporate glossy white trim, paint is an affordable fix for any home. The easiest way to remodel your bathroom is to replace its hardest-working fixture - the faucet. This is a project new homeowners can tackle themselves at a reasonable price. There are a wide variety of faucet options to add a fresh, elegant look to the sink. For a polished look, swap out old hardware with affordable, coordinated accessories including robe hooks, towel rings and towel bars. Dry, winter air causes numerous problems that can adversely affect the health and comfort of your family. Many of these issues materialize indoors, where countless people suffer from dry noses, cracked, itchy skin and sore throats. These health and comfort issues arise because the relative humidity (RH) of cold, outdoor air drops significantly when brought into your home and heated, resulting in dry and potentially damaging indoor air. * Increased likelihood of colds, flu and other upper respiratory ailments. Viruses that cause colds and flu thrive in low humidity - dry indoor air can spread airborne viruses more easily than air that is properly humidified. And dry air can make people more susceptible to infection, as well as aggravate allergy and asthma symptoms. * Home damage. Dry air causes walls, woodwork and hardwood floors to crack. Electronics can fall victim to static electric charges, requiring expensive repair or replacement. * Higher energy costs. Dry air can make you feel cold at normal temperatures, leading you to turn up the thermostat. This leads to higher energy bills. Dry air is also responsible for many of the physical discomforts we experience during the winter including a sore, scratchy throat, nose bleeds and dry lips and skin. The best way to alleviate these symptoms and prevent home damage is by controlling the humidity levels in your home with a whole-home humidifier. A whole-home humidifier, installed as part of your heating and cooling system, is designed to deliver the perfect amount of moisture to your home without constantly making adjustments or refilling the water. Whole-home humidifiers are uniquely efficient and effective because they accurately measure the outdoor temperature and indoor humidity levels to automatically provide the ideal amount of indoor relative humidity - meaning home owners don't have to constantly adjust humidification settings. Simply set it and forget it. Unlike a portable room unit, a whole-home humidification system is connected directly to your home's HVAC and water system, saving you hundreds of trips to the faucet, and hours of messy cleaning over the season. Whole home systems deliver proper humidity levels throughout your entire home and require simple, inexpensive and infrequent maintenance by simply changing an internal water panel once a year. Video Tour - 1024 Texas Star Crt. Shown with pride! Take your time to enjoy this exquisite 1-story, 3-bed, 2-bath home complete with study today. Backing to a greenbelt you will find a treasure inside. Designer tile in the rotunda, upgraded ceiling fans & fixtures, art niches complete with electrical plugs, loads of storage. Enjoy cooking in the kitchen complete with oversized island & ample counters. Energy efficiency offers low utility bills-close to everything! Contact the Grove Team, Keller Williams to schedule a showing of this lovely new listing! From runway fashion to home decor, blue is definitely in the spotlight right now. Give your home a fresh boost of an on-trend color and make it through the fall season in style. If you're warming up to the idea of a new look in your home, but aren't sure how to use color to create a good mood, consider using a fall or pre-holiday redecoration to get ready for next year. Seaside harmony - What says "summer" better than a trip to the beach? While winter's lower temperatures mean you probably won't want to get sand between your toes or dip them into the ocean, you can still enjoy the warmth and relaxation of the seashore. Simply choose colors that echo the natural hues of sun, surf and sand. Cool blue-greens soothe the senses, while gentle peach and soft white evoke the warmth of the sand and revive the spirit. Create the effect with an inspiring wall color. Then, extend the theme throughout your decor with accessories and lighting that celebrate the look of a chic modern resort. Urban alternative - If modern decor appeals to you but you think it might underscore the chill of winter, try an urban alternative look. The style celebrates the warmer aspects of modern decor, emphasizing wood, metal and stone tones. This natural evolution of industrial modern decor creates an effect that feels more modest, relaxed and attainable. A palette of rich browns and soft grays creates this look. Grand reign - From the mansions of the "Great Gatsby" to the magnificent homes of Newport, R.I., Americans continue to be fascinated with grand residences. These opulent homes carry us to another place and time, when the Vanderbilts, Carnegies and Rockefellers set the standard for luxury and elegance with their fantastic homes. You can recreate some of this effect with opulent detail, color and ornamentation. This style works for either richly masculine rooms, the deep eggplant purple or more neutral for delicately feminine ones. Whatever style you choose, colors will create a sense of romance and mystery. Natural avocation - One way to while away the cold hours of winter is with a hobby, and what better hobby for winter than a little nature-watching? Explore the natural disciplines of botany, geology and astronomy with color by choosing tones that call to mind flora, fauna and celestial bodies. Wall colors can bring the vibrancy of the natural world into your home. Color's effect on emotion and energy has been well-documented, and what better time to give your mood a boost than in the fall and winter months? When natural changes in the environment weigh down your mood, you can bolster your mental state - and create a more pleasing, warmer and welcoming environment - by strategic use of color. Bathrooms are certainly among the busiest rooms in any home. But a bathroom can be so much more than just the place where you get ready during your hurried morning routine. One of the hottest trends in home decorating and remodeling is creating a bathroom that serves as a spa-like retreat. Soothing colors and natural materials are right on trend, but if you really want your bathroom to be an oasis of calm, it also needs to be low-maintenance. If you're worried about your beautiful new shower leaking, it's hard to enjoy the experience. Instead, start by taking steps that ensure you don't have to worry about leaks and the damage they cause. Whether you're a DIY expert or hiring the job out to a professional, it's important to carefully review the plans for a new shower. If you're bringing a contractor on for the job, ask what kind of materials and practices they'll be using to ensure that they're not cutting corners. If you're up for a do-it-yourself job, carefully consider the materials you'll use - look for options that make your job easier but don't skimp on quality. * The shower tray: Having the right base in your shower makes all the difference. There's a perception that the best way to ensure a leak-proof base is an expensive and labor intensive mortar bed. But there are solutions that can cut down on cost and labor. A pre-sloped, high-density, molded-foam shower tray is easily compatible with a wide array of tile shapes and sizes, offering comfortable flooring and simplicity of installation. * Waterproof membranes: No matter how beautiful your tile, it's what's underneath that counts. Using a waterproof membrane ensures far better performance long term. A strong (tear-proof) and thin waterproof membrane over a durable backerboard ensures that your shower stays waterproof, even beyond what your eye can see. * The drain: A securely fitted drain will help keep water flowing where it's supposed to go. If you're installing a shower system, consider using the proper drain assembly that goes along with it. Elegant and functional grates integrate with shower systems but still allow homeowners to choose the style that's right for them. Keep in mind that grate height might need to be adjusted to match tile thickness. A carefully constructed shower will hold its beauty for a long time. And that means your bathroom will remain a retreat where you can think about relaxing instead of repairing. While giving a new $900,000 home a thorough going-over, a home inspector found a problem under the deck. The builder had cut corners, using the wrong kind of fasteners to secure the deck to the house. Yet, the municipal building official had approved the work. In some cases, a building inspector is not going to crawl underneath the deck looking at the hardware but a good inspector will. Because it uncovers aspects of the home that are unsafe or not in working condition, an inspection is a must when buying a home. A thorough home inspection by a certified professional can help ensure that there are no surprises. An inspection of the house you want to buy helps identify not only safety concerns and failing structural elements but faulty mechanical systems and areas that soon may need maintenance. You'll pay around $300 to $500 for an inspection, which can take two to three hours. The cost can vary based on your geographic region, and the size and age of the home. Requesting other services, such as septic and radon testing, will add to the fee. An inspection is money and time well-spent.. If your inspector finds things that should be repaired, you can use that report as leverage to have them fixed or negotiate a lower price. * Do your homework: Many contracts include a home-inspection deadline, so start shopping for an inspector when you qualify for a mortgage. This gives you time to find a qualified, professional inspector. * Look for the inspection clause: Before you sign a contract, make sure it includes a clause that makes your purchase contingent on the findings of an inspection with the inspector you choose. This can provide a way out of the contract if the inspector finds a major problem the homeowner won't address. Make sure the clause is included even if the contract specifies an as-is sale, meaning the seller does not agree to make repairs. If a seller's not willing to let you inspect the house, that's a big red flag. * Hire a pro: Shop around. Ask friends, neighbors and real estate agents for recommendations. Look online for lists of certified inspectors and important questions to ask inspectors. * Ask to see a sample report: Inspectors fill out reports, following checklists for different areas of a house. It should be clear and informative. Reports longer than 25 pages filled with lots of legal print — usually meant to protect the inspector against liabilities — raise a red flag. By the same token, a few pages aren't enough. * Accompany the inspector: Take notes and ask about maintenance issues you'll need to address, such as waterproofing the deck, caulking the siding, changing air filters and other matters. * Review the report: The inspector will send you a written report detailing his or her findings. Read it closely and ask questions to make sure you understand the condition of all areas of the home. If your inspector finds a leaky roof, a faulty water heater or some other problem, you may have the right to ask the seller to correct it to your satisfaction or to lower the price. Brand new HVAC units have just been installed, prime Keller location and updated from top to bottom. Did we mention it has a pool too? Call the Grove Team today to schedule a showing of this fantastic home! Many strategies can enhance the flow and function of a home's interior and how a family lives and uses the space. But what about a home's exterior? When it comes to a yard, the same thoughtfulness can help homeowners create functional spaces outdoors that not only look great, but also deliver maximum enjoyment. Here are a few ideas experts use that will instantly improve the function and flow of your yard, helping create a space that is not only beautiful, but value-enhancing, too. Recreation - No matter what size your yard, it's important to incorporate some type of open space. It's visually appealing and offsets other landscape features, plus it's a must for pets and family. Designate at least one segment of your yard for open space, and plant grass or another plant that's friendly to foot traffic. Property line - Define your property with attractive trees, shrubbery and fencing. Keep in mind today's homeowners aren't stuck with bland chain-link fencing. Try mixing sizes of beautiful vinyl fence in different areas. Consider installing a 6-foot vinyl fence in the back of your yard to increase privacy. In the front, a beautiful white picket fence adds a decorative accent with all-American appeal. Relaxation - A deck or patio serves as an area of relaxation typically located close to the home for easy access. Define the space with multifunctional furniture, decorative accents and outdoor dining necessities. Thoughtful placement of furniture helps create boundaries that enclose the outdoor room and encourage socializing and relaxation. Just be sure not to block doors or stairways. Amenities - Value-enhancing amenities should be highlighted in your yard. Do you have a pool? An intimate spa? How about a meditation garden? Add definition to these amenities while also protecting privacy with attractive professional-grade fencing. Functional - Each year, interest in gardening at home grows. The good news is that even a basic vegetable garden can be an attractive yard enhancement. Gardens typically need a sunny location, but make sure the placement doesn't disrupt the flow of the yard. The last thing you want is the kids mistakenly tromping your prize tomato plants. Define the space and protect plants by adding modified vinyl fencing around the perimeter. Concealment - No matter how organized your yard is, there are bound to be items you'd rather not see. Yard waste, garbage cans and compost piles can detract from the beauty of your outdoor space. There's a simple solution: fencing can conceal these things so they don't disrupt the organic beauty of a yard. You can even partition AC units and storage sheds while keeping them easily accessible. Designers and builders know that flow and function are as important outside as they are inside. Homeowners who want to take a fresh look at their existing outdoor space can apply these concepts to help define different areas to improve the appearance and functional potential of their yard for all-year enjoyment. With fall's arrival, many people change out their wardrobe, meals and turn up the thermostat, but often forget that just a few simple changes can get their home and other parts of their life ready for autumn. Here are some quick and simple tips to transition and transform your interior spaces for the season, no matter your budget or style. Freshen up your colors. One of the easiest ways to transition into fall is to switch up the color palette in your home. To get a fall feeling you don't have to rely on just reds and oranges. Add in a pop of yellow to a room with a cool color scheme. Yellow is a foundational color that ties everything together. Adding new throw pillows, a cozy blanket on the couch or a new lamp can make a dramatic difference, and can be easily changed with every season. Small changes can go a long way in making your space feel new and fresh. Upgrade your tech. If your computer is feeling sluggish or you've been longing for a new cellphone, fall is a great time to invest in new technology. With the coming holiday season, there are many sales and deals on the latest technology. And for design lovers, the newest devices don't require you to sacrifice style. Your favorite design concepts - like sleek lines and bold colors - can be found in the technology you use, and now is a great time to match your technology to your lifestyle. Rearrange and reorganize. Rearrange furniture for upcoming gatherings as you move from outdoor entertaining to indoors. Depending on how you like to use your space during the colder months, you can easily make a room feel more formal or more casual. Do you spend your time entertaining dinner guests and serving up cocktails? Bring in a bar cart and arrange your furniture into small group seating areas. More of a movie and popcorn family? Arrange the furniture so everyone has a clear view of the television and a cozy spot to curl up. Dress your table for the season. Set your dining table with new accessories and pieces to liven up your family dinner or cocktail party. Small or large additions to the dining room can have a dramatic impact. Add grandeur to the room with a chandelier above the table, or create depth and visual interest with mirrors throughout. On the table, layer tablecloths, placemats and napkins to bring in the colors of fall for a rich and visually interesting tablescape. These are just a few of the many ways to transition your home into fall. Whether you opt for bold new colors or rearrange your space, you're sure to create a stylish space that signals fall is in the air.